Eid is the breaking of the fast at the end of Ramadan. The holiday is also referred to as Eid al-Fitr, Eid ul-Fitr, the Feast of Fast-Breaking or the Lesser Feast. 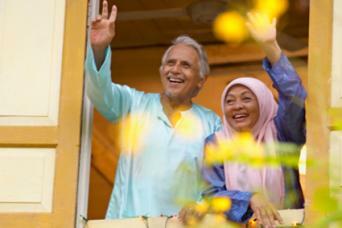 Muslims in Islamic nations and the U.S. celebrate Eid annually. According to Islamic belief, it is a day to praise God and give thanks to him. Eid marks the end of the holy month of fasting known as Ramadan observed by Muslims, according to the Huffington Post. The origin is believed to be from the Prophet Muhammad, which he instituted after completing his journey from Mecca to Medinah. The first known Eid celebration took place in celebration of winning the battle of Jang-a-Badar in 624 CE. The date of Eid changes annually. It is celebrated on the first day of the tenth month of the Islamic lunar calendar, which is known as Shawwal, writes Huffington Post. Traditionally, it starts with the appearance of the new moon. In 2014, the holiday fell on Tuesday, July 29. In 2015, it is expected to be on Saturday, July 18. Islamic holidays start at sundown on the day before the specified date. There can be one-day variations on the holiday, depending on the sighting of the new moon. For example, east coast and west coast Muslims might see the new moon on different days, which also alters the date of the celebration of Eid. Most Muslims wake up early on the holy day to pray. The pre-dawn prayer is Salat ul-Fajr. They then take a bath, wear perfume, brush their teeth and eat breakfast before leaving for the prayer ground to perform additional prayers. As Muslims head to the prayer ground, they declare their faith by reciting the takbir. They also hand out charitable donations to the poor as they make their way to the prayer ground. When they arrive at the prayer ground, they participate in the Salaat al-Eid prayer. For Muslims, Eid is a time to give thanks, similar to Thanksgiving for Americans. Friends and family members gather together to celebrate the holy day. They wear their new clothes. They prepare sweet delicacies, decorate their homes with lights and other decorations, and they give each other gifts. The foods served for Eid depend on the country. Indonesian countries tend to serve rice dumplings wrapped in palm leaves, while Egyptians tend to serve nut and honey filled cookies covered in powdered sugar. Pakistanis serve a sweet pudding made out of vermicelli. In some countries, like Jordan and the United Arab Emirates, Eid can mark the start of a larger three day feast. 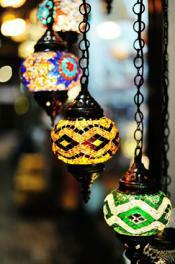 Green is a main color for Eid, so lights and decorations often reflect that color. It is tradition to give gifts of clothes, food, or money for Eid. Monetary gifts are typically included in a card inside of an envelope. Clothing can be wrapped. Food can be put into special containers for presentation as well, but is generally served as part of the festivities. In the U.S., Muslims observe the holiday, but it is not a federal holiday. Some Islamic businesses in the U.S. close or alter their hours so they can participate in the celebration. In some Muslim countries, however, it is a federal holiday.